There is a little baseball in there too, but I don't know much about that. It always looked like so much fun in the American movies I watched as a child - all those hotdogs and the kid delighted at catching the famous guys ball and "I love you" printed on the big screen in a grand proposal - I went to a game during the Sydney Olympics and it was slow and boring and there were no vegetarian hotdogs, so I guess it's something to do with sharing the game with others as you grow up, a bit like cricket and football. In the film the boring bits of the game are cut out and we just see careers made and crushed. There's a cute love story and John Goodman... I'm loving seeing him in a few more films... bring on more John Goodman and Clint Eastwood too. 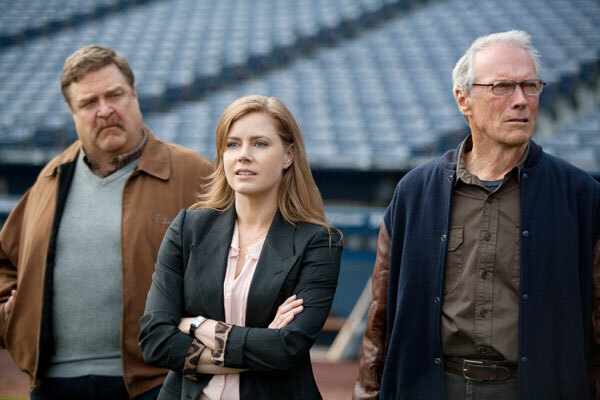 The major stars are Clint Eastwood, John Goodman, Amy Adams, Justin Timberlake and the screenplay was written by Randy Brown.